董明旭, 李建成, 华亮春, 等. 湖南省似大地水准面2017模型及精度分析[J]. 大地测量与地球动力学, 2019, 39(1): 66-71. DONG Mingxu, LI Jiancheng, HUA Liangchun, et al. 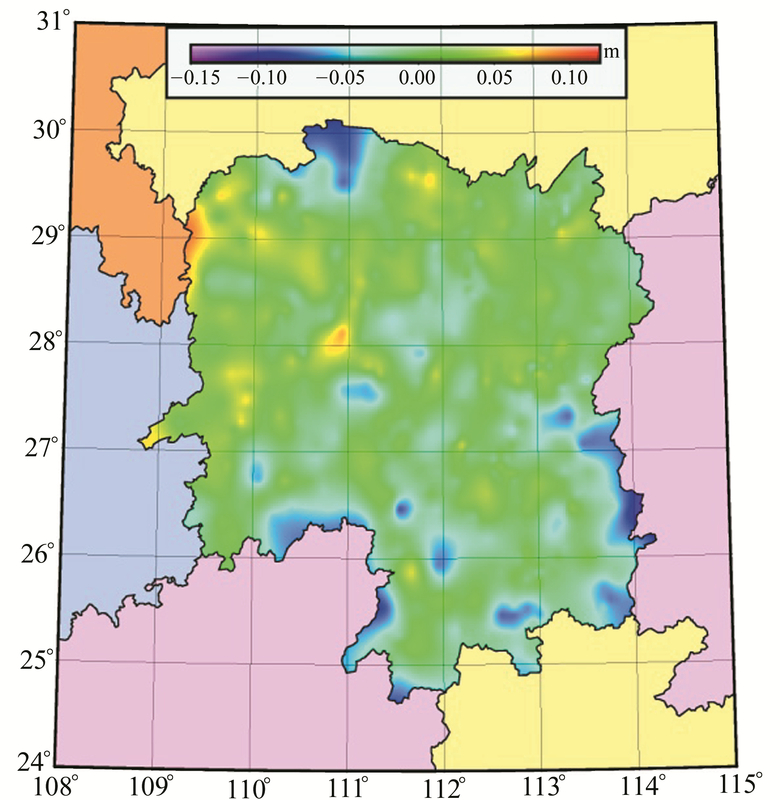 Hunan 2017 GNSS Gravity Quasi-Geoid Model and Its Precision Analysis[J]. Journal of Geodesy and Geodynamics, 2019, 39(1): 66-71. National Natural Science Foundation of China, No. 41371335; Key Research and Development Program of Hunan Province, No. 2016SK2002; Strategic Emerging Industry Development Program of Science and Technology Department of Hunan Province, No. 2016GK4010; Special Fund of Central Guidance on Local, Science and Technology Department of Hunan Province, No. 2017KT5001; Science and Technology Program of Changsha, No. KQ1701171; Science and Technology Innovation Platform and Talent Plan of Hunan Province, No.2018TP2040. DONG Mingxu, professor, majors in geodetic datum keeping and its applications, E-mail: chndmx@foxmail.com. Foundation support: National Natural Science Foundation of China, No. 41371335; Key Research and Development Program of Hunan Province, No. 2016SK2002; Strategic Emerging Industry Development Program of Science and Technology Department of Hunan Province, No. 2016GK4010; Special Fund of Central Guidance on Local, Science and Technology Department of Hunan Province, No. 2017KT5001; Science and Technology Program of Changsha, No. KQ1701171; Science and Technology Innovation Platform and Talent Plan of Hunan Province, No.2018TP2040. About the first author: DONG Mingxu, professor, majors in geodetic datum keeping and its applications, E-mail: chndmx@foxmail.com. 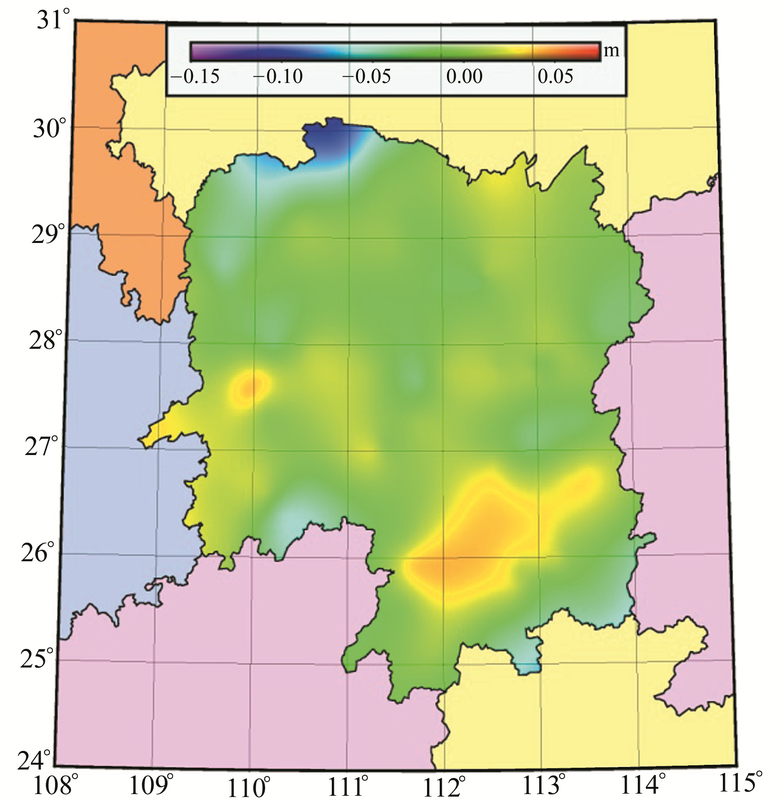 Abstract: Using nearly 70 000 gravity observation data, SRTM topographic data and GNSS/leveling control points data from Hunan and nearby districts, the EIGEN-6C4 global gravity fields model is taken to be the reference gravity field. And the Stokes-Helmert approach and spherical cap harmonic analysis are conducted to construct the 2′×2′ resolution Hunan GNSS gravity geoid model(HNGG2017). 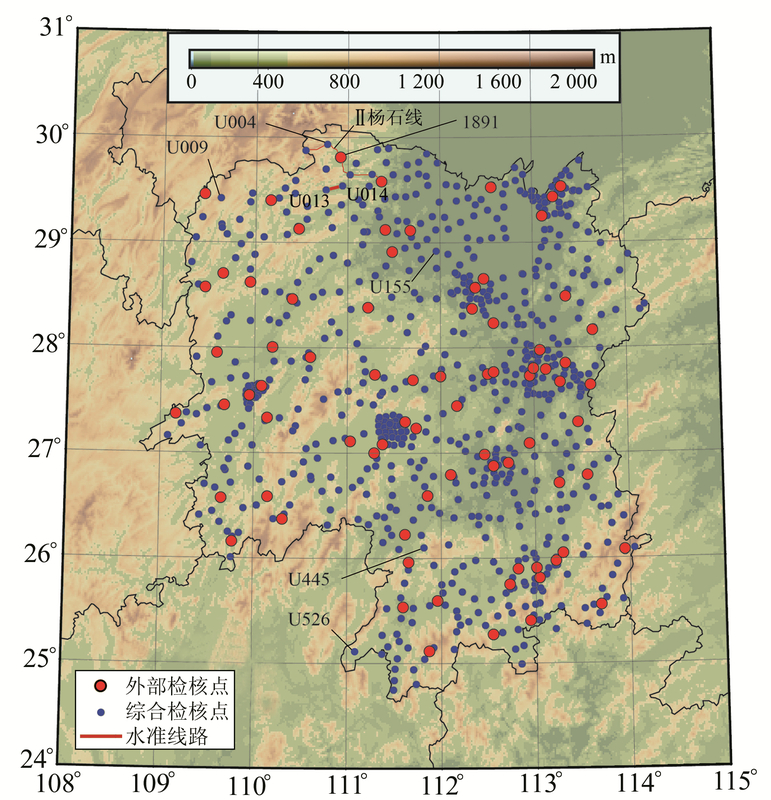 The precision test shows that the external error range is ±0.022 m. Compared to the historic model, the error of the new model in north areas such as Changde Hanshou and southwest areas such as Yongzhou Jiangyong are significantly reduced.